Disclaimer: any specific kid on a specific day may be capable of a wide range of things. Or not capable of things they could do last week. Your knowledge and observations about your kid are a better guide than any number of bloggers or experts. Kids are sponges for new information. Especially little kids don’t know what’s normal outside what your family does. If you hike and camp, they will think it’s normal. 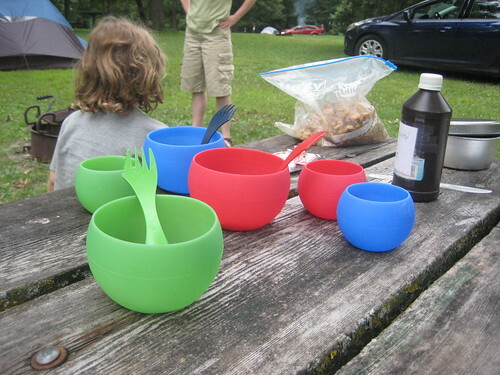 Teach them outdoor skills as you teach them indoor table manners, how to answer the phone, etc. Kids want to be with you, they want to act like adults, they want to help. 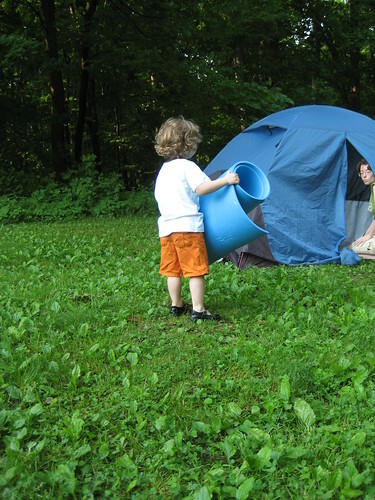 Something even the smallest toddlers can do is clear a spot for the tent. Encourage them to help you pick up sticks, pinecones etc. and make a pile. Depending on the kid’s mood, you may get the whole campground cleared. Even if they pick up one stick and play with it while you set up, they’re not making more work for you. 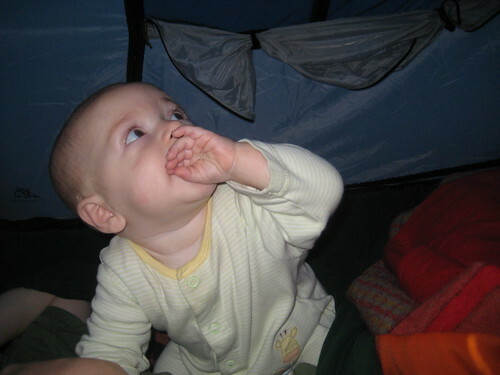 If your kid hasn’t slept in a tent in their memory (which for a baby can be last week), have them “unpack” in the tent and get used to it. Boo’s first night in a tent she was awake far too late exploring. Walkers love to take trips. Trips to the bathrooms, trips to refill water, trips to pay the campground host. I once had 3 kids vying to hold the cap to the water cooler. Kitchen help has to start with kitchen safety. I keep the sharp knife in my hand or pocket. We use an alcohol stove, so I started with “Is it lit?” Of course she thought not. I showed her how to feel for heat with the back of her hand*, slowly. We felt by the stove. We felt by the fire ring. We felt by the neighboring fire ring (that I had seen smoking when we were setting up camp). She understood enough that she couldn’t trust her eyes. At three, she stayed as far away as I liked from the stove, and needed to be convinced to get close enough to the fire to cook marshmallows. *I learned that trick from a blacksmith. The back of your hand, being less calloused, is somewhat more sensitive to heat than the front. And if you do touch something hot, you clench your fist away from the hot thing instead of around it. And the working surface of your hand isn’t damaged. Boo’s still not much help in the camp kitchen. If there’s a table, she can set it. She loves the color-coded mess sets we have. She puts garbage in the garbage bag. She sometimes hands the cook the next ingredient. She’s awesome at handing around dessert. We use a Steripen for water, and she can push the button and hold the pen in the water until it makes a smiley face. She takes this duty very seriously. 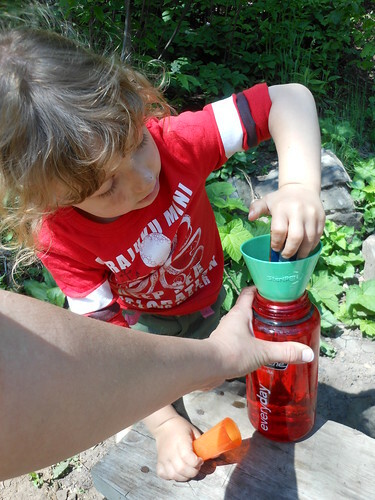 What outdoor skills have you taught your kids? What do you want to teach them? What do you wish you had taught them?